FILE - Senate Majority Leader Harry Reid during a news conference on Capitol Hill in Washington. Democratic U.S. Senator Harry Reid has expressed his support for the agreement the United States and five other nations reached with Iran to limit the country's nuclear program in exchange for sanctions relief. The Senate Minority Leader called the deal "the best path to stop Iran from obtaining a nuclear weapon" in a statement Sunday. His support makes it less likely that Republicans in Congress will be able to muster enough votes to block the agreement, which they and Israel criticize as leaving Iran with too much of a nuclear program while unlocking billions of dollars. He also emphasized his view that the negotiations by the U.S., Britain, China, France, Russia and Germany resulted in terms that will help protect ally Israel from the possibility of being threatened by a nuclear-armed Iran. 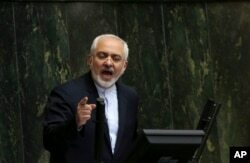 FILE - Iranian Foreign Minister Mohammad Javad Zarif, who is also Iran's top nuclear negotiator, addresses an open session of parliament in Tehran. The international negotiations that ended in mid-July after multiple rounds and extended deadlines were aimed at ensuring Iran's program is peaceful. The agreement cuts back Iran's nuclear activity to lengthen the amount of time it would take for Iran to get itself to a place where it could potentially build a nuclear bomb, and includes the threat of reimposing the harsh sanctions that have badly hurt the country's economy over the past decade. President Barack Obama delivers a speech defending the nuclear deal reached with Iran, at American University in Washington, D.C., Aug. 5, 2015. But Obama has promised use his veto power if lawmakers vote against the agreement. The House of Representatives and the Senate could then try to override the veto, a rare mechanism that requires two-thirds of each chamber to agree. In the larger House of Representatives the situation is less clear, with about a third of the members not yet publicly saying how they would vote. But of those who have taken a position, 16 Democrats have said they will not support the agreement. House Republicans would need at least 27 more Democrats to join their side to reach the two-thirds threshold.